Shortly after I began blogging three years ago I was approached by I Love to Create - an awesome company with tons of crafting supplies I already used and loved - to post for them. I've been posting for them a long time, but I usually post my project here and there at the same time. However, they've asked me to post the projects there rather than here and I just wanted to explain that so you know why I'm sending you there twice a month. 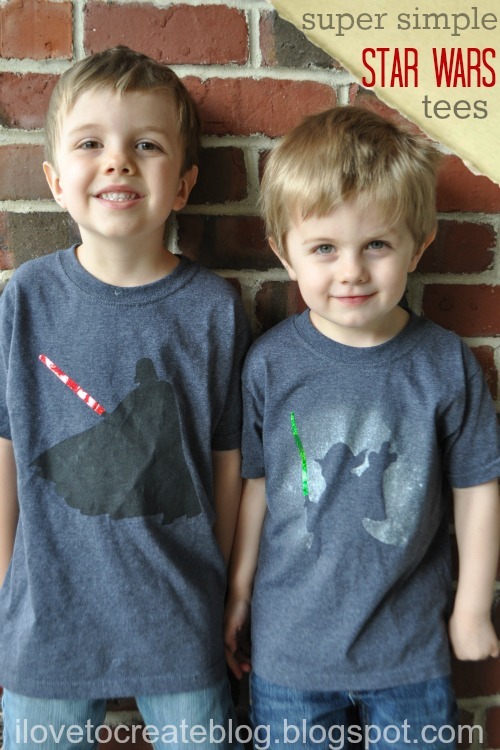 So, the boys really wanted to make one more Star Wars tee and Tulip had a crazy, cool new product that screamed "light sabers," so here's what we made. Get the full low down, instructions, and images by heading over to the I Love to Create Blog HERE. These are great!! My two oldest (6 and almost 4) are loving Star Wars right now. My 3 year old will turn 4 next month and would love something like this. I would love to make one of an AT-AT (using the red as the laser bursts). He does a mean impression. :) I'll have to put this on my to-do list!! LOVE your new header! ADORABLE!! Hmmm...My boys might need some new Roar inspired t-shirts! :o) Thanks so much for sharing your GREAT ideas!!! Wow! I think I could do this! Thanks for sharing!!! Love these. Your boys are always on par with mine!